Let your kids learn about Shakespeare and the performing arts in the most exciting possible way! In this two-week training program for ages 8-13, the professional actor playing Hamlet for ISC this summer will lead your kids through an exciting exploration of what it's like to perform Shakespeare live! Give your kids a chance to experience Shakespeare as a living, breathing art form, completely relevant to our lives today, meant to be performed on stage in front of an audience — rather than a dusty set of confusing words in a book they're forced to read in school. In addition, they'll get a great behind-the-scenes look at the preparations for ISC's summer productions of Hamlet and Love's Labour's Lost. 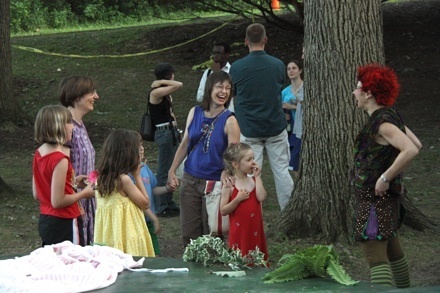 And the best part is: at the end of the class, your kids will get to perform a selection of Shakespeare scenes chosen just for them — on the ISC stage at Cornell Plantations, in front of the ISC's audience, during the first weekend of ISC's summer shows! This will be a unique opportunity for your kids to learn about Shakespeare in an active, exciting way, from a group of 4 professional actors who are doing it for real. The camp will be taught and directed by Theo Black, a member of Actor's Equity Association who received his MFA from The Shakespeare Theatre's Academy for Classical Acting in Washington, D.C. He has performed with The California Shakespeare Theatre, Lake Tahoe Shakespeare Festival, Illinois Shakespeare Festival, and others, and has been a teaching artist with the Hangar Theatre and ActingOutNY, as well as teaching and coaching at both Ithaca College and Cornell University. Theo will be assisted by 3 other members of the ISC cast, all of whom are working professional actors with teaching experience. Because space is limited, we are asking kids to come to a friendly, informal audition session on Saturday or Sunday, May 24-25, at Fall Creek Studios. Have your kids prepare a short speech and/or song which they love! 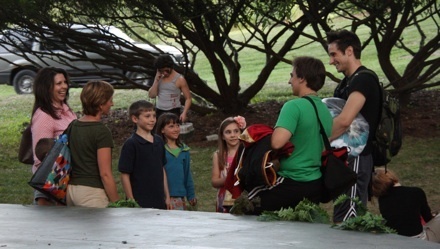 More young Shakespeare fans meeting the Puck!